Everybody is concerned with their credit score these days. Everybody wants to rebound as quickly as possible after a bankruptcy case. A better credit score will indicate that you are a better risk for future credit opportunities. The interest rate that you can garner will be better if your score is better and your overall financing opportunities will be better. Now if you make your payments on time each month, you should be rewarded with either a better score or at the least reported evidence of those timely payments. Unfortunately, this is not the case for a mortgage debt which is not reaffirmed in a bankruptcy case. 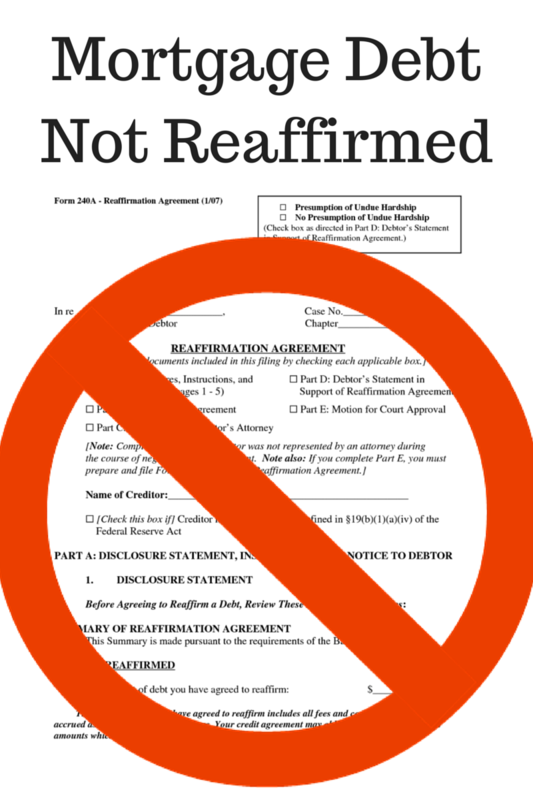 The bankruptcy code is very specific with regard to reaffirmation agreements. The legislature in their amendment of October 17, 2005, clearly decided that mortgage debt was not a debt that had to either be reaffirmed, redeemed or surrendered. Unlike a vehicle debt and other secured debt, mortgage debt found a unique place in the bankruptcy code and in bankruptcy cases. A mortgage debt does not need to be reaffirmed. The debtor can simply continue to make voluntary payments towards that debt. Most lenders will not even offer a reaffirmation agreement because they know that most attorneys would never advise their clients to sign it. There is simply no reason to sign it. Why put the client back on the hook for a debt when they don’t have to? It is better to let the debtor make voluntary payments on the debt. Then if something were to happen down the road where the debtor could not pay, the mortgage company would have no recourse other than to foreclose and take the property. There would be no monetary judgment at that point. The real problem arises when the credit bureau doesn’t seem to reflect the ongoing voluntary payments by the debtor. The mortgage companies simply feel that the debt is discharged and that there is no duty or obligation to report the voluntary payments. However, the laws regarding fair credit reporting should be amended to provide that payments on a discharged mortgage must be reflected to the credit bureaus. The Bureau is simply not getting the entire story. The mortgage companies’ reluctance or failure to report the positive payment history is wrongfully hurting the debtor. Payment history is reflected on all debt that is reported to the Bureau prior to the date of filing. If the debtor reaffirms on a debt such as a vehicle or a credit card, the payment history gets reflected to the Bureau. Since the debtor is well within his or her rights to make voluntary payments on a mortgage and keep the home, the lender who is accepting those payments should be mandated to report that timely payment. This would simply be an easy legislative amendment to the fair credit reporting act. Nobody would be harmed by such reporting. In fact, the debtor would benefit. And why shouldn’t the debtor benefit? After all, he is making timely payments to a lender who is accepting the payments. He is paying down the debt and getting closer and closer to an eventual mortgage payoff. Why should he be punished simply because he followed the bankruptcy code and made voluntary payments on a discharged mortgage debt? This is something that the legislature should fix and do so quickly. If the debtor is damaged by his failure to pay as reflected in the Bureau, he should be rewarded with his ability to pay and that should be reflected in the Bureau as well.